Engineers from Harvard University have designed and demonstrated ice-free nanostructured materials that literally repel water droplets before they even have the chance to freeze. 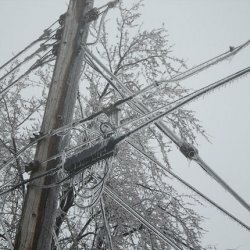 The finding, reported online in ACS Nano on November 9th, could lead to a new way to keep airplane wings, buildings, powerlines, and even entire highways free of ice during the worst winter weather. Moreover, integrating anti-ice technology right into a material is more efficient and sustainable than conventional solutions like chemical sprays, salt, and heating. "We wanted to take a completely different tact and design materials that inherently prevent ice formation by repelling the water droplets," says Aizenberg. "From past studies, we also realized that the formation of ice is not a static event. The crucial approach was to investigate the entire dynamic process of how droplets impact and freeze on a supercooled surface." "Freezing starts with droplets colliding with a surface," explains Aizenberg. "But very little is known about what happens when droplets hit surfaces at low temperatures." "We fabricated surfaces with various geometries and feature sizes—bristles, blades, and interconnected patterns such as honeycombs and bricks—to test and understand parameters critical for optimization," says Lidiya Mishchenko, a graduate student in Aizenberg's lab and first author of the paper. The nanostructured materials prevent the formation of ice even down to temperatures as low as -25 to -30 degrees Celsius. Below that, due to the reduced contact area that prevents the droplets from fully wetting the surface, any ice that forms does not adhere well and is much easier to remove than the stubborn sheets that can form on flat surfaces. "We see this approach as a radical and much needed shift in anti-ice technologies," says Aizenberg. "The concept of friction-free surfaces that deflect supercooled water droplets before ice nucleation can even occur is more than just a theory or a proof-of-principle experiments. We have begun to test this promising technology in real-world settings to provide a comprehensive framework for optimizing these robust ice-free surfaces for a wide range of applications, each of which may have a specific set of performance requirements."